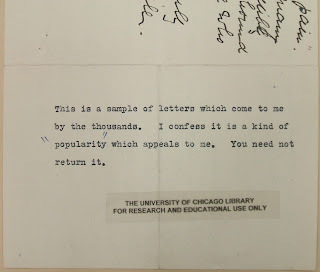 Editor's Note: In Chapter Two of Everyday Reading, P&PC studies an archive of fan letters written in the 1930s and mailed to the popular, nationally-broadcast poetry radio show Between the Bookends, which received upwards of 25,000 such letters per month at the height of its popularity. These letters are oftentimes movingly (perhaps embarrassingly) confessional, make large and sometimes (it would seem) exaggerated claims for the importance of poetry in listeners' lives, and sound almost bizarre to our ears today for those very reasons. Who knew that the venerable Poetry magazine also received the same types of letters—and that editor Harriet Monroe didn't just pitch 'em into the trash but collected them in a special file she labeled as her "museum" file? In the following guest posting by one of the most provocative new voices we've encountered on the modernist studies scene, Erin Kappeler—currently a Mellon/ACLS Dissertation Completion Fellow at Tufts University and pictured here and above—ruminates on the implications of these letters (and the poetry they reference) for how we think about their writers, Monroe's aesthetic, Poetry's role in shaping the landscape of American poetry, and American poetry criticism in general, which has frequently bestowed upon Poetry a privileged, even messianic, place in the rejuvenation of American verse in the twentieth century. This material comes from the final chapter of Kappeler's dissertation, Shaping Free Verse: American Prosody and Poetics, 1880-1920, other segments of which are forthcoming in Critical Rhythm (ed. Jonathan Culler and Ben Glaser, Fordham University Press). We love what Kappeler has to say about Monroe's Museum, and we think you will to. 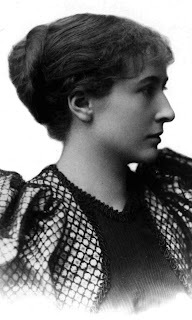 In her autobiography, published two years after her death, Harriet Monroe (pictured here) reflected on why she founded Poetry magazine in 1912: "[T]he well of American poetry seemed to be thinning out and drying up, and the worst of it was that nobody seemed to care. It was this indifference that I started out to combat, this dry conservatism that I wished to refresh with living waters from a new spring" (250). By most accounts, Monroe succeeded. As the poet A.R. Ammons once noted, "[T]he histories of modern poetry in America and of Poetry in America are almost interchangeable, certainly inseparable" (qtd. in "The Moneyed Muse"). Poetry has come to stand for an experimental strain of American poetry that supposedly revitalized a dying art form. 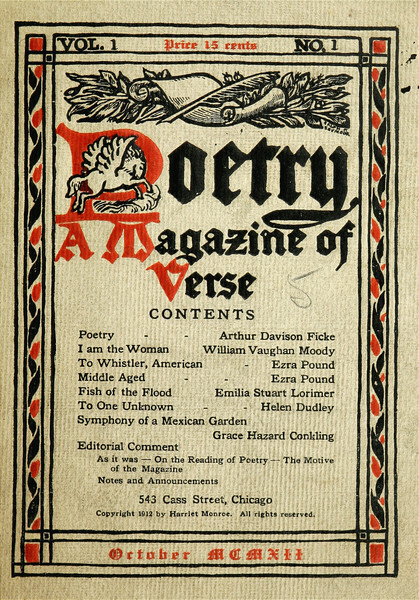 While the mouthpieces of genteel culture such as Scribner's, the Atlantic, and Century "policed Parnassus" and enforced a "restrictive standard" of aesthetic value that stifled public interest in poetry, as Andrew DuBois and Frank Lentricchia argue in the Cambridge History of American Literature, Poetry, with its promise "to print the best poetry written today, in whatever style, genre, or approach," seemed to open up a new world of poetic possibilities that widened the audience for poetry. 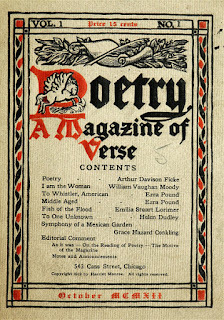 The genre that had become extraneous to the American reading public was suddenly brought back into contact with the currents of "living waters," saving poetry from cultural irrelevance. This is a compelling story, and, to paraphrase Hemingway, it would be pretty to think that it was so. 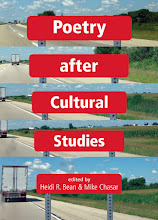 But rumors of poetry's demise were sparked by a particularly narrow view of poetry's role in cultural life. 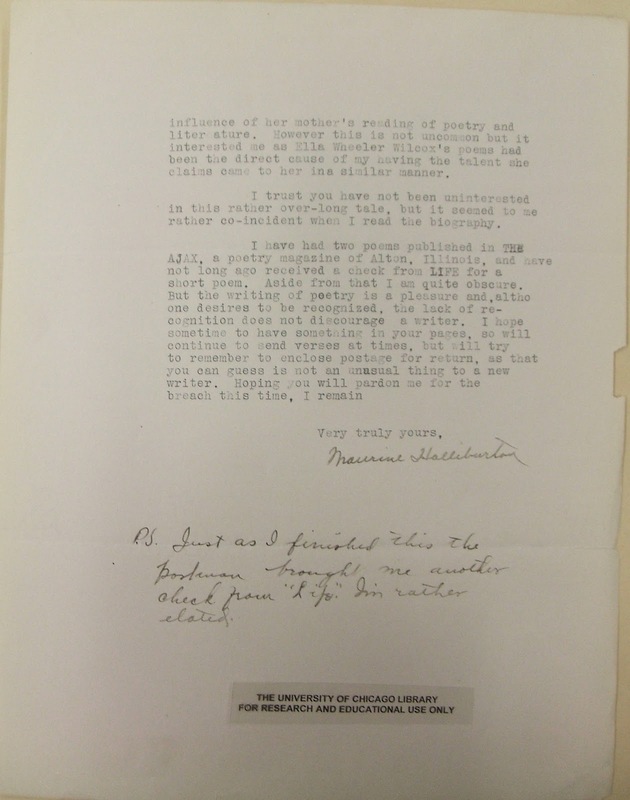 Any number of sources can dispel the idea that the poetry of the 1890s, 1900s, and early 1910s was stagnant, out of touch, and unread, but one particularly useful (and surprising) source of evidence is the archives of Poetry itself. 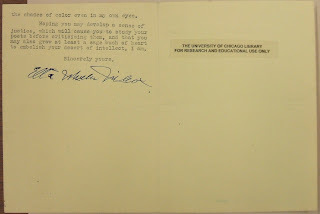 Monroe donated her editorial files to the University of Chicago in 1931, including a series she labeled "museum" files (now boxes 42-46), which house an impressive array of fan letters, poems, complaints, and appeals, identified variously as "boosts," "knocks," "crank letters," and "amusing letters." 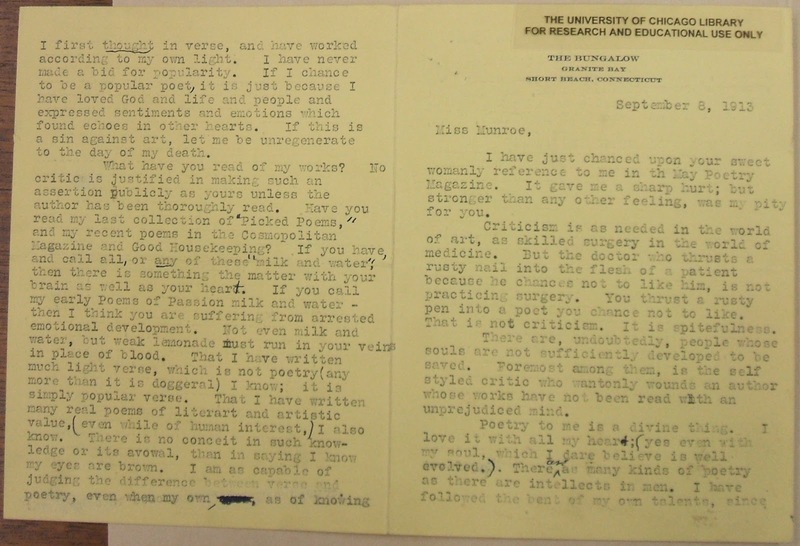 The curious thing about these files is the way they group seemingly outré exchanges with letters from poets who simply seem too lowbrow for Poetry. The ramblings of an isolated crank or religious visionary, for instance, are given as much credence as the protests of Ella Wheeler Wilcox or the entreaty of an amateur poet. This grouping reflects Monroe's tendency to dismiss as uniform in character any aesthetic paradigms that did not mirror her own. 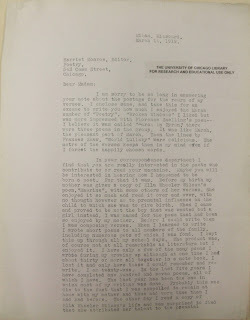 If none of the hundreds of unsolicited letters she received on a monthly basis (Monroe claimed that at one point Poetry received roughly 2,500 poems from 500 would-be contributors every month; only a small percentage of these letters are represented in Poetry's official archive) reflected her own self-avowedly modern poetic vision, then it proved that American poetry was going through a particularly arid phase, and "needed stirring up" (249). 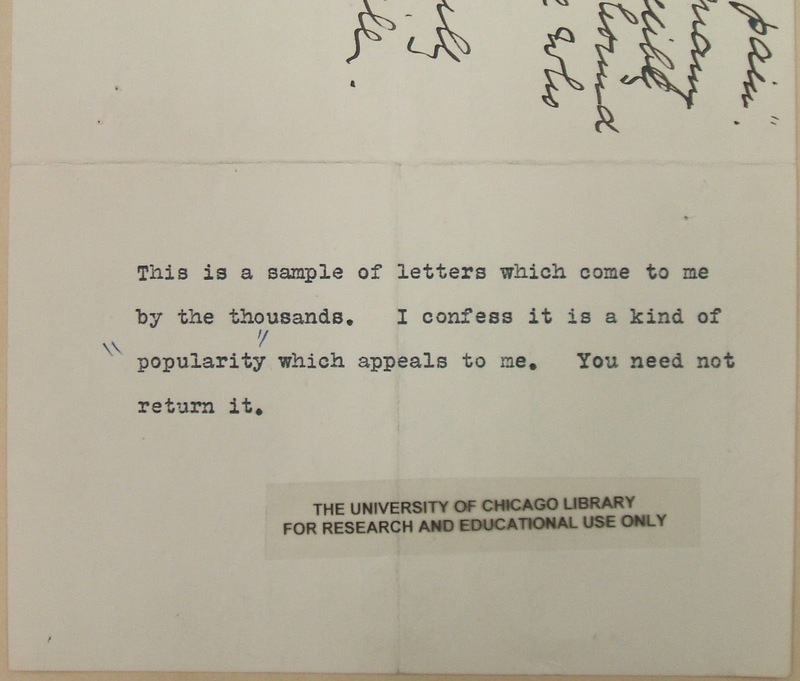 But the sheer volume of these letters gives the lie to the story of poetry's stagnation. A closer look at Monroe's "museum" files shows that, far from bringing poetry to readers who had been ignoring it, Monroe sought to discipline readers out of their promiscuous habits of consumption. In your correspondence department I find that you are really interested in the poets who contribute to or read your magazine. Maybe you will be interested in hearing how I happened to be born a poet. For that it was. Before my birth my mother was given a copy of Ella Wheeler Wilcox's poem, "Maurine," with some other of her verses. She enjoyed it so much and read it over and over, with no thougth [sic] however as to prenatal influence on the child to which she was to give birth. When I came and proved to be not the boy that was wanted but a girl instead, I was named for the poem that had been so enjoyed by my mother. Before I could write them I was composing verses. When I learned to write I wrote short poems to all members of the family, including numerous poets of which I was fond. I kept this up through all my school days. The product was, of course not at all remarkable as literature but I enjoyed it. I have only a few of the many poems I wrote during my growing up although at one time I had about thirty or more all together in a note book. I lost it and only have those I could remember and re-write. I am twenty-one. 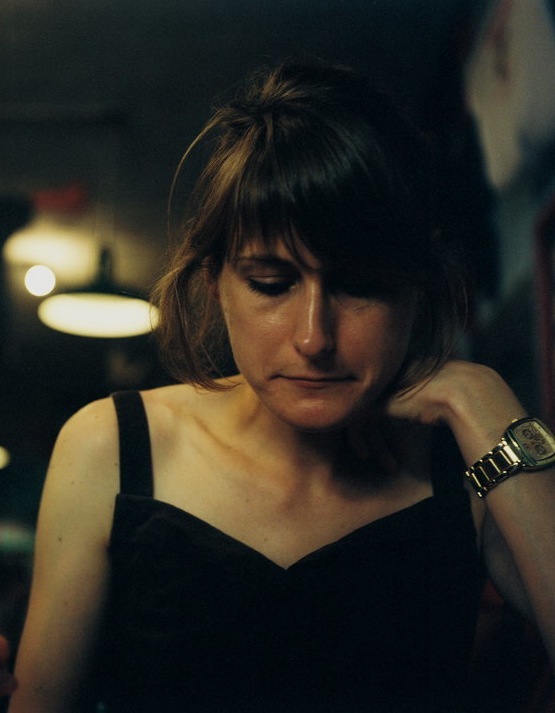 In the last five years I have completed one hundred and seven poems, all of which I have. The last year has been the one in which most of my writing was done. Probably this was die [sic] to the fact that I was compelled to remain at home with my mother and thus had more time than I had had before. 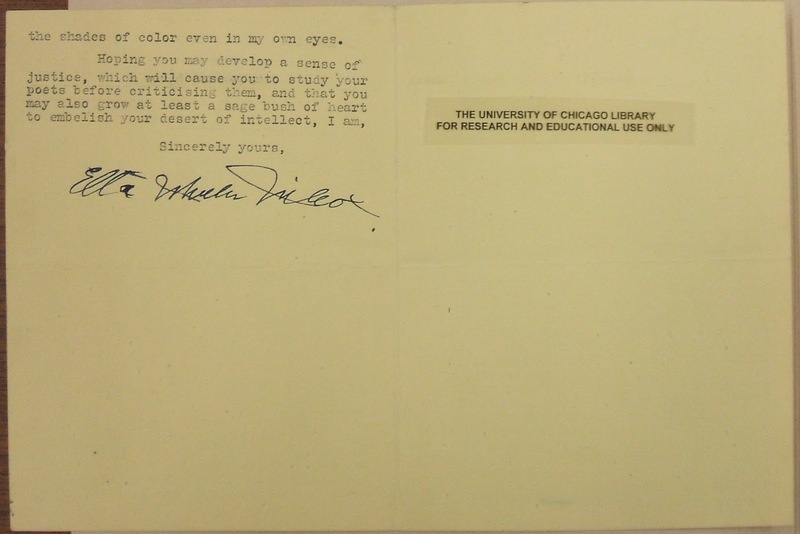 The other day I read a copy of Ella Wheeler Wilcox's life and was surprised to find that she attributed her talent to the prenatal influence of her mother's reading of poetry and literature. However this is not uncommon but it interested me as Ella Wheeler Wilcox's poems had been the direct cause of my having the talent she claims came to her in a similar manner. I have had two poems published in THE AJAX, a poetry magazine of Alton, Illinois, and have not long ago received a check from LIFE for a short poem. Aside from that I am quite obscure. But the writing of poetry is a pleasure and, altho [sic] one desires to be recognized, the lack of recognition does not discourage a writer. I hope sometime to have something in your pages, so will continue to send verses at times... P.S. Just as I finished this the postman brought me another check from "Life." I'm rather elated. 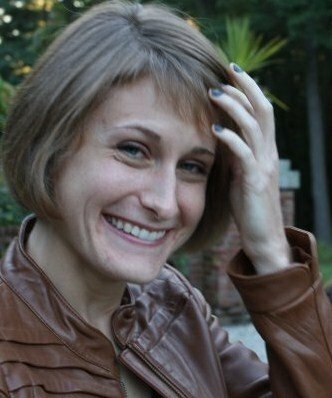 For Halli- burton, getting published in Life was proof that she was a poet. She recognized that Poetry was a step up from The Ajax and Life in terms of prestige, but she underscored the continuity between commercially successful popular poetry and prestigious "literary" poetry. There was no reason why a popular poet such as Wilcox could not inspire a poet to create both light verses for mass-market magazines as well as "high" literary work that would be worthy of Monroe's notice. Life confirmed her talent, and this success encouraged Halliburton to do something more "literary" that would belong in Poetry. For Halliburton, as for so many other Poetry subscribers, modern poetic practices were capacious enough to include both the Monroes and the Wilcoxes of the world, and this capaciousness was poetry's strength rather than a sign of its decline. 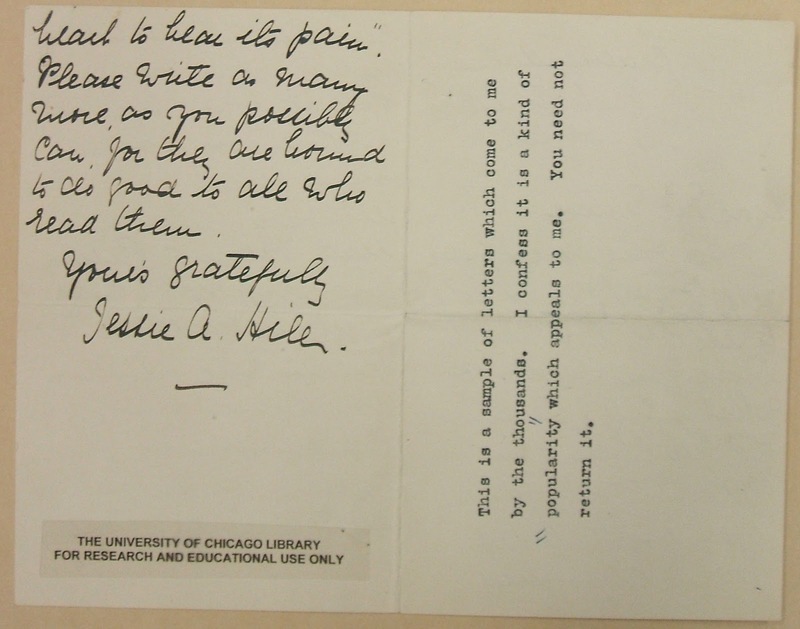 Wilcox herself had tried to say the same thing to Monroe in 1913. 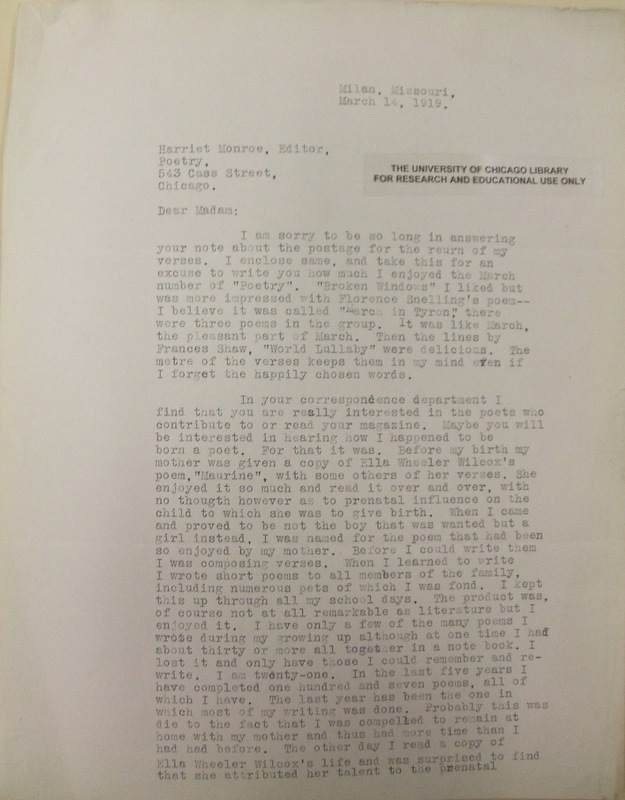 After Monroe dismissed Wilcox as a "milk-and-water" poet in one of her editorials, Wilcox sent a sharp rebuke, explaining that, "There are as many kinds of poetry as there are intellects in men," and that Monroe's "assumption that 'lovers of the art resent my kind of work' is only true when these lovers chance to be of your special make of mind. There are other kinds!" 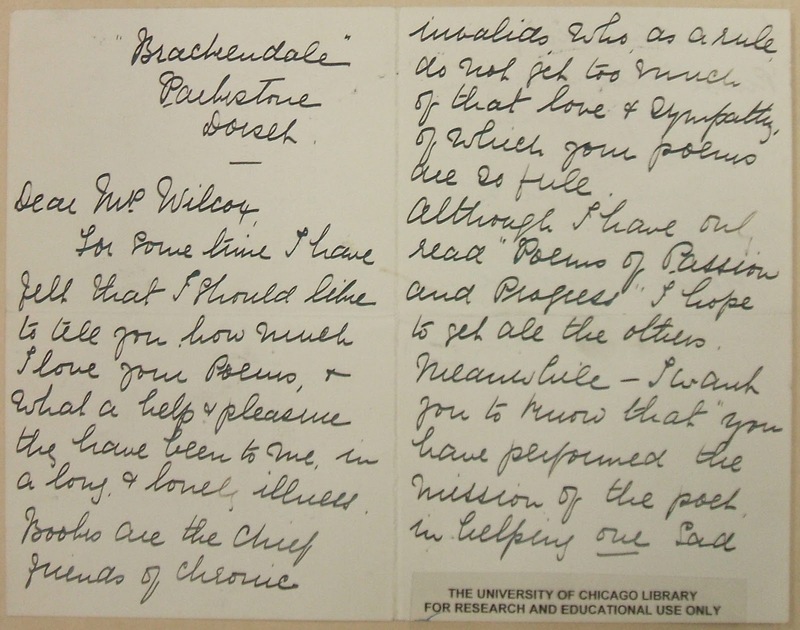 (Pages one and two of Wilcox's letter are shown in the paragraph above and the one here.) 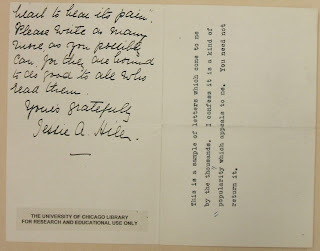 As proof, Wilcox included a letter she had received from an admiring reader named Jessie A. Hill (see the following two pictures) who wrote to Wilcox to say that, "I should like to tell you how much I love your poems, & what a help & pleasure they have been to me, in a long & lonely illness.... I want you to know that 'you have performed the mission of the poet in helping one sad heart to bear its pain.' Please write as many more as you possibly can, for they are bound to do good to all who read them." 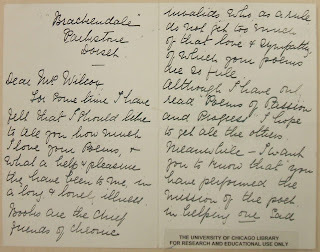 Wilcox added a note to this enclosure (the final image of this posting below), explaining that it was "a sample of letters which come to me by the thousands. I confess it is a kind of 'popularity' which appeals to me." For Halliburton and Wilcox alike, holding out a single aesthetic standard for poetry would result in a misreading of much of the poetry available to readers at any given time and would fail to do justice to the multiple roles that poetry could play in social life. If "milk-and-water" poetry failed on an aesthetic level, it remained vitally connected to the everyday life of thousands of readers who found in it ways to cope with the personal and existential disappointments of modern life. Monroe was unswayed, of course. 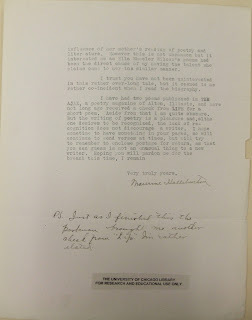 As the marketing materials for Poetry attest, Monroe was interested in the prestige value of poetry and how cultural capital could be converted to actual capital via officially-sanctioned prizes, societies, and institutions. Wilcox and Halliburton had as much place in this vision of poetry as did "Her Grace—the Almighty God, Human Name Grace C. Wright," who wrote to warn Monroe that the poems she submitted to Poetry were "Divine, they bear an inspired message" and that "in two years time all art, science, culture ... will kneel at the feet of the Almighty God the writer of the trash you rejected and find in that God, that Life, a Science, an art above all sciences." 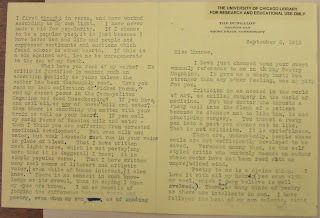 Monroe filed Halli- burton's letter right next to Wright's in her "crank letters" series, implying that all affective uses of poetry were at best foolish and at worst crazy. Monroe's version of aesthetics won the day, which has made it difficult for us to hear Halliburton's and Wilcox's voices as anything other than naïve and a little embarrassing. But these are the voices that remind us that poetry before modernism was not at all out of touch with the daily life of an average American. If anything, it was too much a part of it, which prompted Monroe and other modernists to stake a claim for poetry as a purely aesthetic concern.